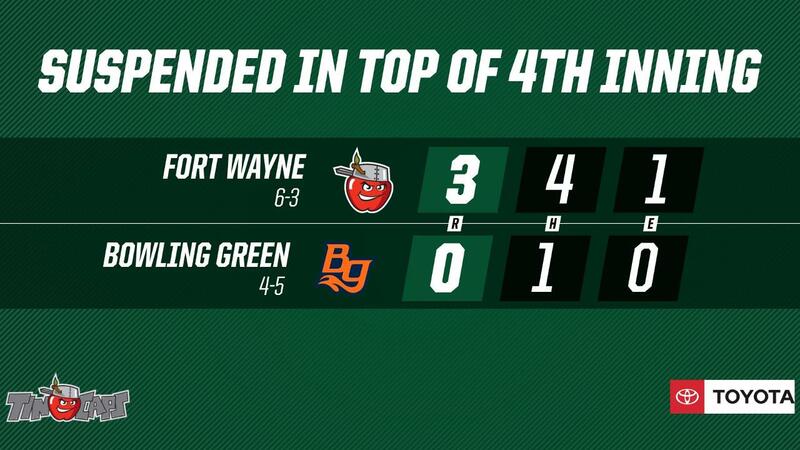 BOWLING GREEN, Ky. - Michael Curry , in his TinCaps debut, hit a three-run homer in the top of the fourth inning against the Hot Rods on Saturday night at Bowling Green Ballpark, but that was the final swing of the night. Fort Wayne and Bowling Green were suspended by rain after Curry crossed home. Saturday night's suspended game will be resumed with two outs in the top of the fourth inning on Sunday afternoon at 1:30. The 'Caps and Hot Rods will finish their game that's scheduled to go nine innings. Following the end of the game, there will be a 30-minute intermission, and then the teams will be set to play a seven-inning game for the series finale. Curry's home run came on the seventh pitch of his at-bat against Hot Rods (4-5) right-handed starter Caleb Sampen, a Brownsburg, Ind., native. Curry, a University of Georgia alum who joined the team from Extended Spring Training on Thursday, drove in catcher Blake Hunt , who had singled, and third baseman Luis Almanzar , who drew a 10-pitch, two-out walk. TinCaps (6-3) starter Gabe Mosser was through three scoreless innings by the time the rainy conditions made the game unplayable. Note that Sunday's originally scheduled game was to begin at 3:05 p.m., but the schedule has been altered as a result of the suspended game. Game 2: 30 Minutes Following the Conclusion of "Game 1"